Queen’s fosters intellectually curious, globally engaged citizens. Queen’s aims to help its students develop curiosity, academic depth and breadth, and mastery of their subjects and degree. We have a team of over 60 tutors dedicated to producing excellent tutorials (small-group classes held in the evenings) and workshops. Students can request further one-on-one consultations with tutors to extend their content knowledge, ask questions, and hone their skills in writing, research and referencing, coding, data analysis and so forth. Our students can also polish their academic style through publishing in the College’s peer-reviewed academic journal, Aedificamus. Every semester Queen’s awards a Wyvern medal to students who have gained an H1 average for their studies. Queen’s has a very well-stocked and spacious Library, as well as overflow study spaces such as the Tower Commons and the Founder’s Room. Students studying art or design have access to a designated studio space with superb light (the Tower Studio), and receive funding for their materials. We also have a number of music spaces, as well as opportunities to develop performance repertoire and skills through events throughout the year. Queen’s is dedicated to producing global opportunities for our students and encouraging our residents to consider the global challenges of our time. These opportunities are coordinated though Queen’s Sugden Institute. Students have daily opportunities to meet international leaders in scholarship through our Visiting Scholars and Academic Associates programs, as well as to hear and meet inspirational speakers at events such as our Indigenous Oration, Sugden Oration, and Faculty Dinners. 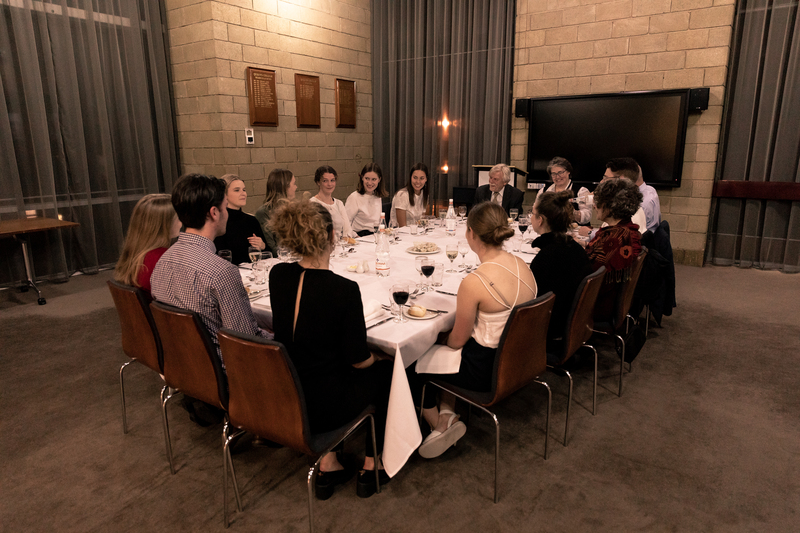 Our ‘dine with a scholar’ program on Tuesday nights in 2018 invites students to consider such topics as artificial intelligence, Chinese music, journalism and ‘clean data’, bioethics and gene editing, social activism in Myanmar, and new technology (Tesla). The Armistice Prize, awarded to a work of art, prose or music that honours fallen Wyverns, was inaugurated in 2018.